In wake of Baltimore’s announcement that John Harbaugh will continue as the team’s head coach in 2019, the Ravens finally solidified themselves as legitimate Super Bowl contenders. Since the team’s last playoff appearance in 2014, Baltimore has consistently failed to close tight games against good opponents. This simple failure is what separated the team from the playoffs in recent years. The Ravens did not clinch a playoff berth yet and don’t entirely control their destiny either. If the stars align just right, the Ravens could win out and still miss the playoffs. Despite this, the Ravens proved themselves as contenders should they make the playoffs, and with a victory next week, they likely will. The Ravens inched closer to the playoffs by defeating the Los Angeles Chargers in Baltimore’s best game since the 2014 playoff victory in Pittsburgh. The Ravens dominated in all forms of the game. Baltimore’s offense outgained the high-powered, Phillip Rivers led group, 361 to 198 yards. The Ravens held the Chargers, who typically garner 379 total yards, to 51 rushing yards and 147 passing yards. Baltimore also controlled the time of possession 31: 25 to 28:35. The Ravens defense even held the Chargers to a below average 3rd down conversion rate. The Chargers typically convert on 40% of all their third down attempts, but only converted on 30% on Saturday night. The defense owned the Chargers, and the battle was the most important factor in deciding the victor, but there was another storyline developing last night. 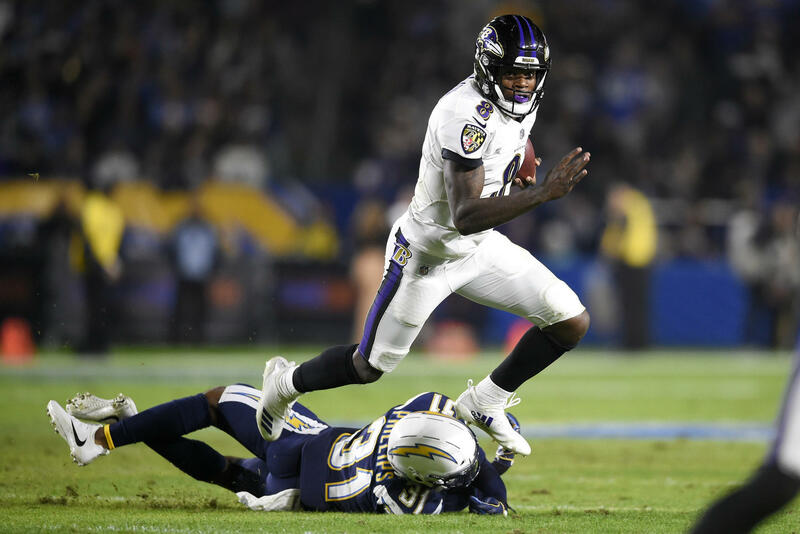 Rookie quarterback, Lamar Jackson, played a breakout game against the Chargers. For the first time in his young NFL career, Jackson secured the win by using his arm, and not his legs. Jackson completed 12 of 22 passes for 204 yards and one touchdown. Jackson’s efficiency through the air allowed him to yield most of the rushing responsibilities to the running back corps. Gus Edwards rushed 14 times for 92 yards, and Kenneth Dixon 8 times for 28. Jackson did contribute to the ground attack but was not as successful as in recent weeks. He rushed 13 times for 39 yards. His performance elevates the confidence that the Ravens already have in him. Baltimore hopes to see Jackson develop into the team’s second franchise quarterback. His performance on Saturday indicates that he definitely has the potential.